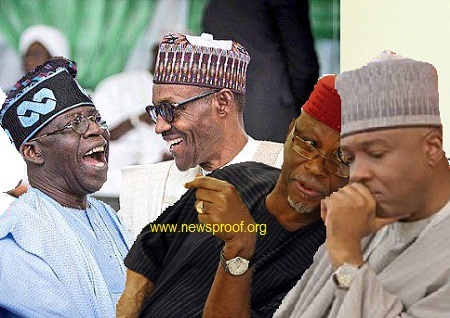 The renewed friendship between the National leader of the ruling All Progressives Congress, APC, Asiwaju Bola Ahmed Tinubu and President Muhammadu Buhari has reportedly stirred a serious panic within the camp Chief John Odigie-Oyegun led National Working Committee, NWC of the party. To this end, the party’s national executive has tactically relocated its weekly meeting to Asokoro, the residence of its national chairman. It was gathered according to Blue Print that while some members of the NWC had expressed support for Tinubu, others are also ‘aggrieved’ that the president could make such appointment without recourse to the NWC. Findings, however, revealed that the weekly NWC meeting, which usually holds at the party’s NWC Room on the Third Floor every Monday, was taken to the Asokoro residence of Chief Oyegun, the party’s national chairman. A top source at the APC secretariat also told our correspondent that since Tinubu’s appointment was announced by the Presidency, the Oyegun-led NWC had been thrown into panic. It was also learnt that the aggrieved NWC members might be making moves to lobby some APC governors with backing for Oyegun, to crumble the assignment which Tinubu had already kick-started.